A dense plant with double pink blooms, this Prairie Joy rose grows in a Morden garden. It has excellent disease resistance. 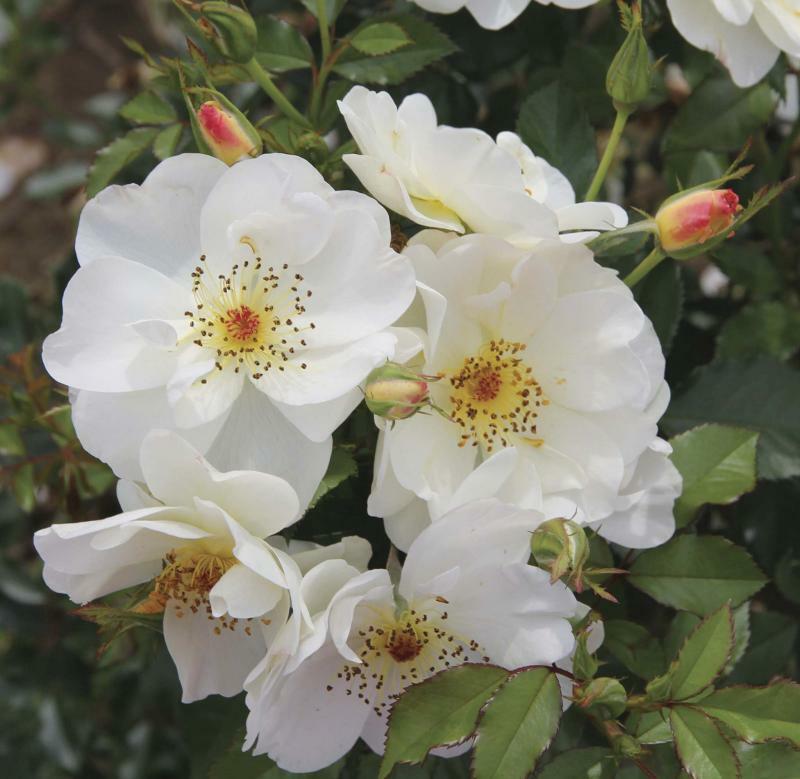 A must-have rose with pristine white petals, Oscar Peterson’s upright habit and narrow width make it a perfect fit for today’s compact garden. Aphids prepare to feed on this otherwise pristine Winnipeg Parks rose. Use a strong spray of water to dislodge them. Peach Lemonade is a refreshing, multi-coloured rose with long lasting blooms. Oh, sweet Neil Diamond rose with crackling rosy colour. Cover this tender hybrid tea rose for the winter with a rose cone that allows for air movement. Who can resist a rose? Turns out that while most plant shoppers take time to stop and smell the roses on display at garden centres, sales of the flower are on a downward trend. In this era of low-maintenance plants, roses command admiration and awe for their exceptional beauty so long as they are growing in someone else’s backyard. The popular belief is that roses are too much work and too insect- and disease-prone. What plant in the garden, though, isn’t subject at some point to the risk of a bothersome pest or possibility of disease? Many reblooming roses embrace fall’s cool temperatures with a final flush of brilliantly coloured blooms. There are few other plants in the garden that are still producing rapturous blooms this late in the season. Still not persuaded? If the vision in your mind is that of infested leaves, then let’s deal with the problem head-on. A hard frost is on its way, which will make short work of the leaves on roses. If possible, remove all of the leaves on your rose plant — in addition to any that have fallen to the ground — and get rid of them. This helps to ensure that disease spores on leaves don’t overwinter. Applying horticultural oil and lime sulphur early in spring helps to control pest populations. You can find it as a dormant spray kit, and package directions recommend that two parts lime sulphur be mixed with one part dormant oil. Apply the spray before leaf buds show green at the tips. Choose a windless day when the temperature is 5 C or warmer — typically in early April — and spray early to allow the spray to dry on your rose. The spray is more effective if temperatures remain above freezing overnight and rain is not in the forecast. The combination spray works by smothering soft-bodied pests such as aphids and rose sawfly or their eggs. Take care to not overdo it as beneficial insects can also be affected. This pretreatment works best when combined with good cultural practices. Important factors for rearing healthy roses include annual soil amendments such as compost, mulching with a layer of shredded leaves, providing adequate air circulation and directing irrigation at ground level rather than overhead watering. Early monitoring and control of pest populations will pay off. I find that using a hand-held one-litre pressurized spray bottle filled with water works far better at dislodging aphids than a random, sometimes too-forceful spray of water from a hose. Regular watering throughout the summer, particularly during dry spells, is important. Ensure that roses are well-watered before freezing temperatures arrive. I don’t prune my roses for winter. Rabbits chew on the thorny canes above the snowline throughout the winter without detriment so long as the crown is protected. A circular enclosure or collar of wire-gage hardware cloth fencing provides the necessary winter protection from rodents, especially for the delectable stems of new roses that are so irresistible to critters. 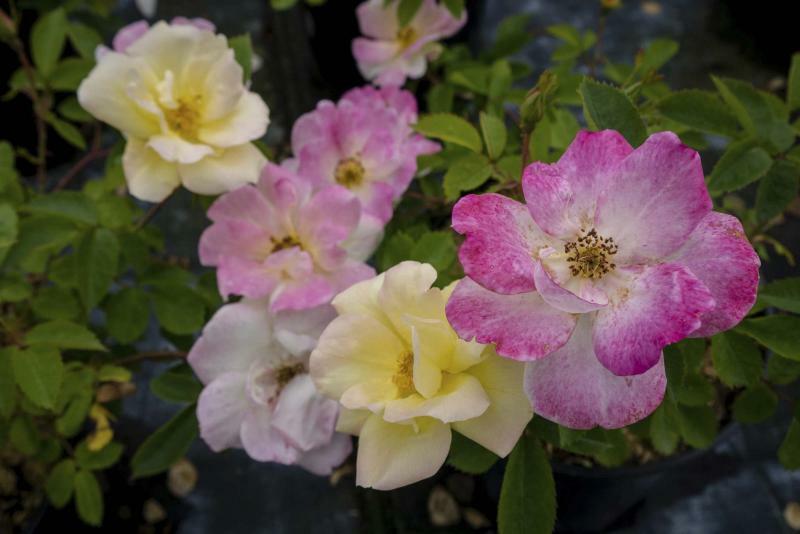 Monique Rampton, co-owner of Morden Nurseries, recommends that the graft or bud union on tender varieties such as hybrid tea roses be buried at the time of planting. In late fall, prior to freezing, tender roses should be mounded with a layer of peat moss or soil for winter protection. 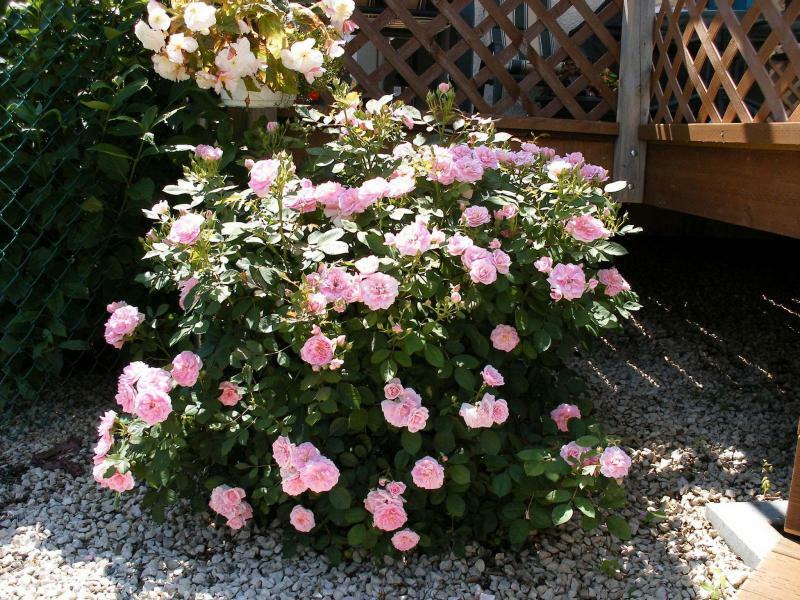 "Allow some ventilation when covering a new or tender rose with a box or rose cone," Rampton says. A sealed environment around the rose results in mould issues if the temperature inside the cone becomes too warm. Add a few small holes to the top and base of the cone. "Don’t be in too much of a hurry to uncover your rose in spring," Rampton says. Early warm spells in March or April are often followed by a period of plummeting temperatures, which can cause damage. There are so many great varieties of roses to grow in your garden. One of my favourite roses is Winnipeg Parks, a shrub rose with cherry-red blooms that was developed at Morden Research Station. Another is John Davis rose, a fragrant climber with profuse double pink blooms. One of the Explorer series of roses, John Davis grows up to 2.5 metres tall and requires only minimal pruning. A beautiful example grows in Tim Evans’ Winnipeg garden. Evans waits until spring to remove any dead branches and also adds a slow-release fertilizer at that time. Both Winnipeg Parks and John Davis offer good disease resistance and Zone 2b hardiness. Rampton says there are a number of exceptional older and hardy roses that deserve a place in the garden. One is Therese Bugnet, a sweetly fragrant pink-flowered variety that exhibits very little disease and has a long season of bloom from mid-June until frost. Awarded an RHS Award of Garden Merit, Therese Bugnet grows to a mature height and spread of 1.5 m and is suited to the back of the border or as an informal hedge. Prairie Joy rose, developed at Morden Research Station, is a highly desirable pink flowered rose with double flowers that have up to 40 petals. Prairie Joy has excellent disease resistance and grows to 1.25 m. A beloved rose with a dense form, Rampton says there are examples in Morden where Prairie Joy is grown as a hedge. Rampton says that the Never Alone rose, a compact variety that grows to only 0.6 m, is the top-selling rose at Morden Nurseries. The vibrant white centres of this red-coloured rose, a recent introduction, seem to almost glow. Top marks, in my opinion, belong to the Oscar Peterson rose. Extremely disease resistant, it has a strongly upright, narrow form (a mere 0.9 m height and spread) and impeccable, glossy foliage. It produces an abundance of pure white flowers with golden yellow stamens. The buds are an eye-catching creamy yellow with hints of apricot. I must have more. Campfire rose is another beauty but has more of a spread (1.25 m). One of the hardy roses in the Canadian Artists series, Campfire has semi-double, tricolour blooms. The clusters of pointy buds with their yellow and red tones open yellow and are edged in a deep rosy pink. It blooms non-stop until frost. This year I trialed Peach Lemonade rose in my garden. A multi-coloured rose as well, the noticeably long-lasting blooms start out as a refreshing lemon yellow, then transition to a rosy pink, until fading to pale pink. The size is compact — less than a metre tall and wide. Hardy to Zone 4, I plan to completely cover it with shredded leaves and good snow cover for the winter. 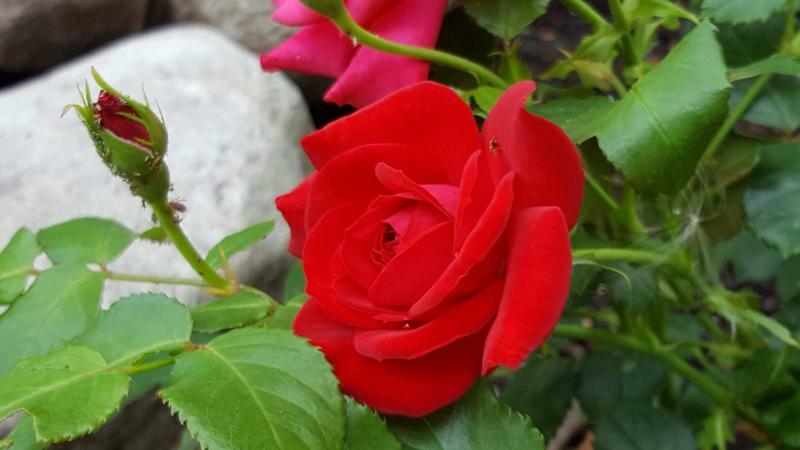 In 2016, Patricia Osmond entered her Neil Diamond rose in the Transcona Garden Show where it was awarded best rose in its class. 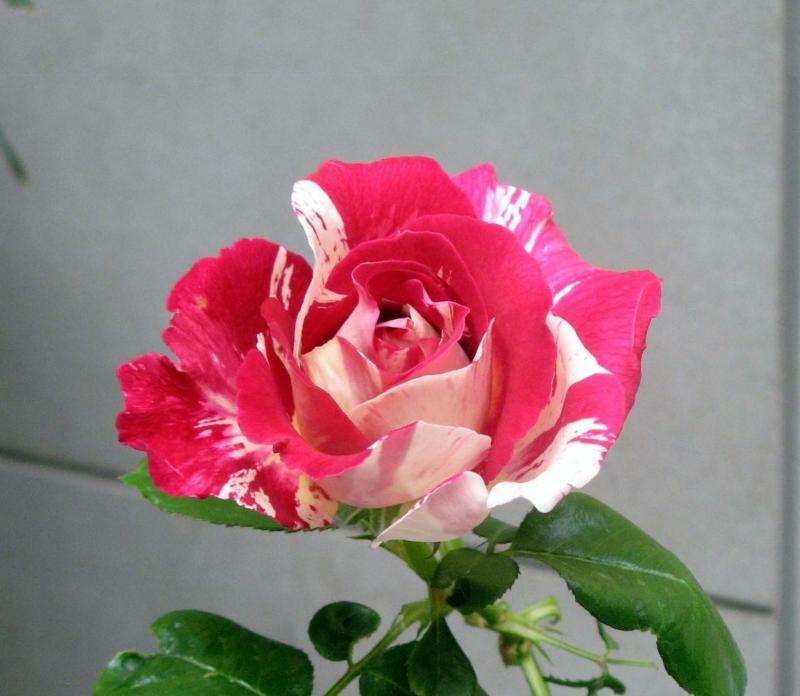 Spectacularly beautiful, this tender hybrid tea rose has deep pink petals with white stripes. Classified as Zone 5, Osmond grows her rose in a protected south-facing location. Osmond describes the foliage as flawless and highly disease resistant. Despite protective measures to overwinter, the rose experienced severe dieback after its first winter. Still, it produced new buds from the base of the plant and grew to 76 cm. Some things in life are worth the trouble.